I'm attracted to 'hidden histories', the stories of marginalised, outcast and disenfranchised people in the past. My book Notorious covers the life stories of thirty such people who made a living from prostitution, theft and violence in 19th century Cardiff. Their stories are definitely hidden as there's nothing written about them. It's been difficult to resurrect the lives of these people from the fragmented sources that remain but it's been possible with determination and the help of digitisation (thanks National Library of Wales) and good archives (thanks Cardiff libraries and Glamorgan Archives). One history that remains hidden is the brothel of Mary Ann Wright. The other established brothels from this time have a wealth of newspaper and court records written about them. See my post on 31 Charlotte Street as a case in point. But, despite running for at least 24 years on Whitmore Lane, Mary's brothel is quiet, very quiet. After two years of searching this is all I have on Mary Ann Wright. Mary Ann Wright, together with Mrs Prothero, was one of the earliest brothel keepers that I know of on Whitmore Lane. 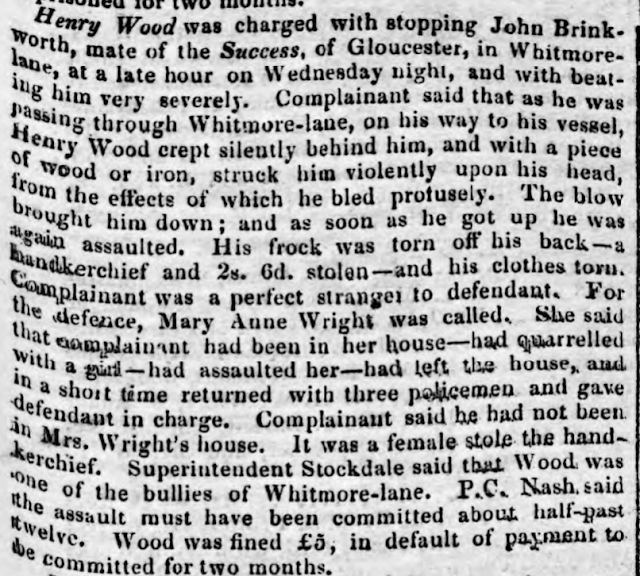 The first we hear of her is in 1837 when Superintendent Stockdale was ordered to prosecute a 'Hannah Wright- Widow' for keeping a Disorderly House. Mary Wright is already 50, 'lodging house keeper' here is a polite euphemism for brothel keeper and the census writer has written 'single woman' for each of the women living there, again, another euphemism for prostitute. Mary has six girls: Catherine Davies, Mary Morgan, Ann Evans, Fanny Bancha, Mary William and Ann Cheguin. Mary Williams was arrested for being a 'common and disorderly prostitute' in August 1842 and was described as 'an old offender' when she was arrested for drunk and disorderly in November 1844. Ann Cheguin soon after this census was taken conceived a son. He died on the 20th March 1842 of 'convulsions' aged three weeks, although she had moved to the slum court of Stanley Street by then. Similarly Catherine Davies and Fanny Bancha I haven't been able to trace further and Ann Evans is too common a name to say if any report on her is the same one. There is one enigmatic record of an 'Ann Wright v Geo Davies PC' on the 10th February 1845 entry of Superintendent Stockdale's log book- but no information is given apart from the names- but I know George Davies, PC6 was on the Custom House Beat at this time- and the Custom House was on Whitmore Lane. What Ann was charging the constable with we will never know. It seems unrelated to the charge above it against The Tennis Court landlord. Mary Ann Wright herself is not mentioned until 1848 when there are two incidents. First off in June 1848 the boatman Thomas Miles breaks a door and assaults Mrs Wright. Lots of the boatmen were bullies or pimps and he is probably here breaking into Mrs Wright's brothel. 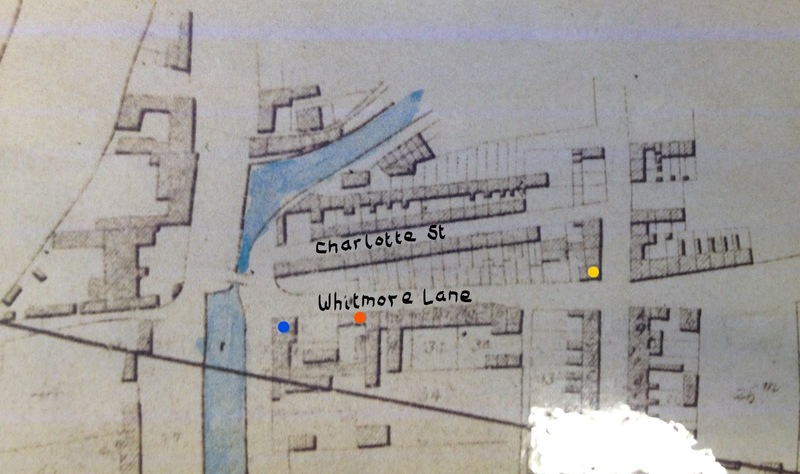 In 1851 Mary A Wright, now aged 77, is again listed on the census running a brothel at 47 Whitmore Lane, this end of the street was near to the Custom House where the sailors got paid off (probable location marked on red in map at start of blog). She is listed with Mary Ann Howells, Mary Ann Jones, Ann Williams and Ann Atkins. Mary Ann Jones is very probably 'Cockatoo' who was already an experienced prostitute from Newport who worked there from 1843 to the start of 1847. 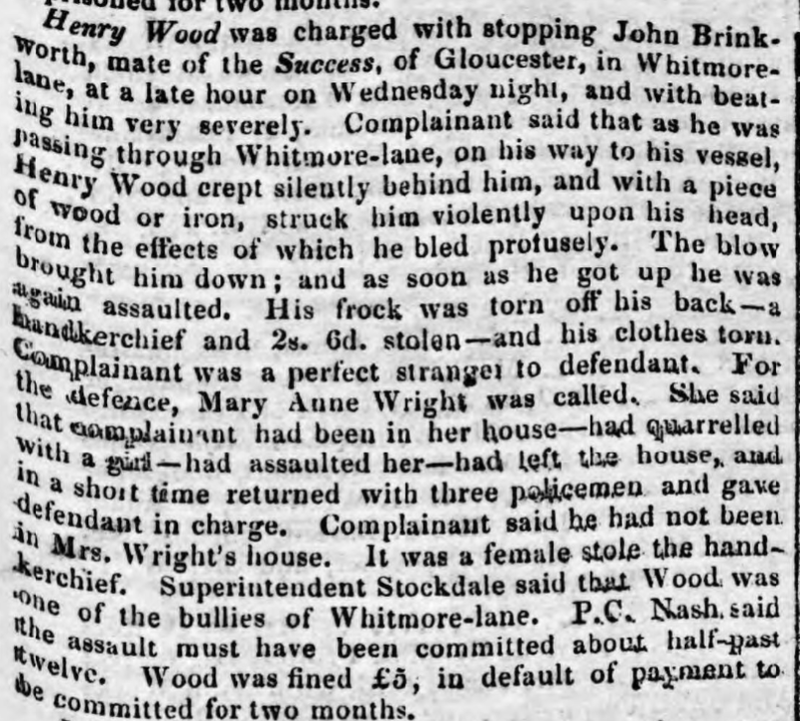 She'd moved to Whitmore Lane by August 1847 where she was grossly misconducting herself! Then there's another blank of five years until Mrs Mary Ann Wright dies from heart disease and bronchitis on the 15th February 1860 after running her brothel for two decades (I like to think she passed away in the night after her last St Valentine's Day). She was aged 80, a phenomenal age at the time. The informant of the death was yet another Mary Ann- Mary Ann Thomas. This Mary Ann was described as 'good-looking' in the newspaper reports of her arrest a few months after the death of her madam. Interestingly Mary Ann Thomas only appears in the police records in the months after the death of Mrs Wright. She's arrested for drunk and disorderly charges in May, July, August and October 1860 and also in March 1861. Mrs Mary Ann Wright was buried February 17th at St Johns aged 80. And that's it. Apart from three references, the two in 1848 and the one in 1855 this is all I can find that reference Mrs Wright's brothel. Obviously there are quite a few references to the girls who were working in her brothel, especially the 1851 batch, but that doesn't mean they were working for Mrs Wright when they were arrested in the years before or after 1851. Compared to Mrs Prothero's brothel- which was active around the same time from 1836-1856- and had many, many mentions in the newspapers Mary Ann Wright's brothel was extremely quiet. Why was it so quiet? I suspect three possible reasons. One: Mary kept a tight ship. She seems to have employed 'careful' women to work there who didn't get into a lot of trouble, Mary Ann Jones, Fanny Bancha and Ann Cheguin being examples. Believe me there were plenty of loud, heavy drinking women who weren't afraid to steal from their marks and fight back when required. Two: She died in the same month that saw the first round of crackdowns on the brothels in 1860. I suspect no matter how careful she was she would have come under the radar of the police and private individuals who began systematically prosecuting the brothels of Charlotte Street and Whitmore Lane from February 1860 onwards. Three: For me this is the main reason. There was no beerhouse linked financially or physically to her brothel. Drink, especially late at night, brought trouble and the joint beerhouse/brothels and brothels supplied by beerhouses were much more rowdy places. I think that Mrs Wright's brothel catered for the sailors who were spending more than one night with the women, while they waited for their ship to load or unload or they waited for another berth on another ship. There is some evidence for these short term relationships in the other brothels but in the main the other brothels seemed to have been 'walk-in' night by night places. I suspect Mrs Wright's place catered for regular sailors and that's why there was little trouble there- brothels themselves were not illegal before 1860 and so as long as it was quiet the law would have left it alone. Mary Ann Wright was careful enough to avoid trouble and so avoid attention from the law. It can't have been an easy task and she must have negotiated her every day life with skill, resilience and forethought. Unfortunately for us this means we know little about her. Mary Morgan: Monmouthshire Merlin March 20th 1841 p.3. Mary Williams: CMG August 6th 1842 p.3. DCONC/8/1 Superintendent Stockdale's Log Book February 10th 1845. MM November 2nd 1844 p.2. Mary Ann Jones CMG August 28th 1847 p.3. Ann Williams: CMG July 12th 1851 p.3. CMG April 17th 1852 p.4. CMG May 8th 1852 p.4. Thomas Miles: The Principality June 16th 1848 p.5. Henry Wood: Cardiff Merthyr Guardian September 2nd 1848 p.3. Ann Atkins: CMG September 11th 1852 p.4. Mary Ann Howell: CMG August 13th 1853 p.3. Mary Ann Thomas Cardiff Times May 12th 1869 p.8. Burial St John's Cardiff 17th February 1860 N.396.